If you prefer to manually send your proposal using an email client instead of Nusii, you will need to let our system know. Otherwise your proposal will still be in draft mode. If you send the proposal without updating its status, it will not know how to track the proposal. To manually update the status of a proposal you need to be in 'Proposal overview'. Next, click on 'Manually change state'. This will open a modal, here you should select 'Sent and pending'. 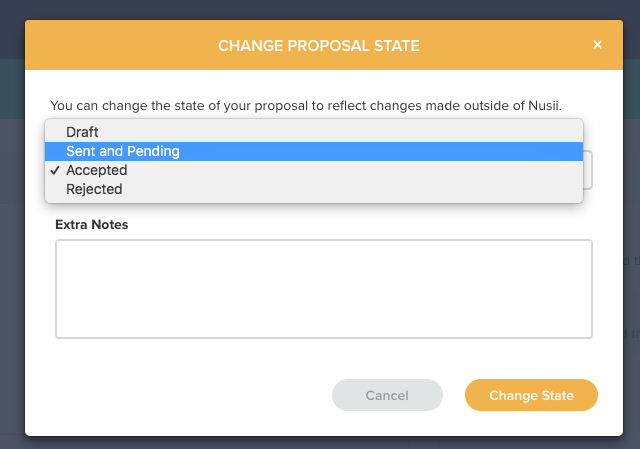 Now Nusii will know to track any proposal interactions...And of course let you know about them.